It's the Mayday weekend of 1993 and I'm "mopping up" a few unclimbed summits in Wainwright's "Central Fells" book. One of these summits is Raven Crag, technically an offshoot of High Tove but way over to the northeast in the Shoulthwaite forest overlooking Thirlmere. The best line of approach is to take a series of paths and forest roads up from the Thirlmere dam. 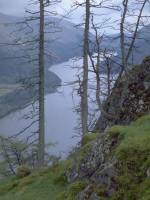 This is a view of Thirlmere from the ascent. From the col between the Thirlmere and Shoulthwaite valleys a clear (though unsigned) path leads to the top. 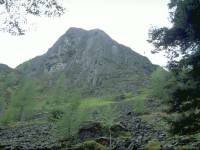 The summit is a dramatic outcrop of rock, elevation 1520ft. 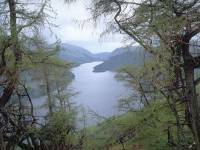 Here you'll get the best view of Thirlmere there is. Shame the weather was dull. Views in other directions are restricted by trees. There is a sheer drop to the east and you need to watch your step up here. The return is by the same route. Here's a dramatic shot of Raven Crag itself from a clearing halfway down. 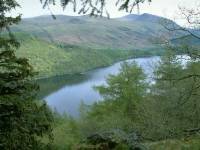 ...and, from pretty much the same spot, another view of Thirlmere with Raise, White Side and Helvellyn beyond. I went on to climb High Rigg across the valley in the afternoon, but the photos aren't worth showing.